Home > Blog > Spotlight Pets > Spotlight Pet of the Week – Chico! Spotlight Pet of the Week – Chico! Meet Chico | Available for Adoption! After almost 270 days in rescue, Chico is once again our Spotlight Pet of the Week! 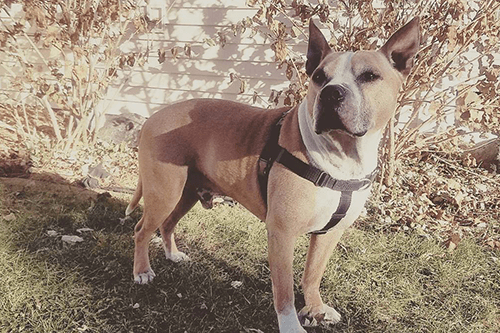 Chico is a mellow, gentle 12-year-old pitbull looking for his furever home. He is a smart, easily trainable boy who already knows all his basic house manners. Chico loves his people, and loves nothing more than a quick walk followed by an evening snoozing next to his human. He’d do just as well in an active, busy home as he would in a more easy-going environment. Chico has had a long, tiring life, and would prefer to be an only fur-child in his furever home so he can get all the attention and nap whenever he wants. Chico has been waiting 9 MONTHS for his furever home, and we’d love for this sweet old man to find his family soon! To help find Chico the perfect home, the Petfinder Foundation has generously agreed to sponsor Chico’s adoption fee! In addition to being a senior pet, Chico also has his hypothyroidism working against his quest for a furever home. In addition to sponsoring his adoption fee, the Petfinder Foundation will also be covering one year of his medication and a round of testing to evaluation his thyroid function through our veterinary partners at MetroPet Animal Hospital. We are very hopeful that with the support of the Senior Pet Grant, we will be able to find the perfect home for Chico soon! MEET ME/ADOPT ME: Think this guy might be the dog for you? Please fill out an adoption application by visiting Adoption Application Page. A volunteer from Twin Cities Pet Rescue will contact you once your application is reviewed. Check out more stories about me and my friends on TCPR Facebook Page!